(Nanowerk News) Researchers from the University of Toronto (U of T), King Abdullah University of Science & Technology (KAUST) and Pennsylvania State University (Penn State) have created the most efficient colloidal quantum dot (CQD) solar cell ever. Quantum dots are more efficient when packed tightly together. "We figured out how to shrink the wrappers that encapsulate quantum dots down to the smallest imaginable size – a mere layer of atoms," stated Professor Ted Sargent, corresponding author on the work and holder of the Canada Research Chair in Nanotechnology at U of T.
"We wrapped a single layer of atoms around each particle. This allowed us to pack well-passivated quantum dots into a dense solid," explained Dr. Jiang Tang, the first author of the paper who conducted the research while a post-doctoral fellow in The Edward S. Rogers Department of Electrical and Computer Engineering at U of T.
"Our team at Penn State proved that we could remove charge traps -- locations where electrons get stuck -- while still packing the quantum dots closely together," said Professor John Asbury of Penn State, a co-author of the work. "At KAUST, we used visualization methods with sub-nanometer resolution and accuracy to investigate the structure and composition of the passivated quantum dots," stated co-author Professor Aram Amassian of KAUST in Saudi Arabia. 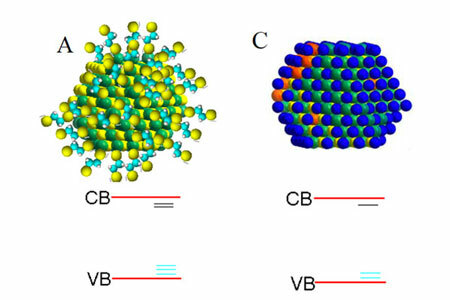 "We proved that the inorganic passivants were tightly correlated with the location of the quantum dots and that it was the chemical passivation, rather than nanocrystal ordering, that led to the remarkable colloidal quantum dot solar cell performance," he adds. "It is very impressive that the team was able to make solar cells with power conversion efficiency up to 6% from quantum dots," stated Professor Michael McGehee of Stanford University, a world-renowned expert in solution-processed organic solar cells. "There is a lot of surface area in these films that could have dangling bonds which would hinder the performance of solar cells by creating traps states. The team's quantum dots had the highest electrical currents and the highest overall power conversion efficiency ever seen in CQD solar cells. The performance results were certified by an external laboratory, Newport, which is accredited by the U.S. National Renewable Energy Laboratory. "This work proves the power of inorganic ligands in building practical devices," stated Professor Dmitri Talapin of The University of Chicago, a pioneer in inorganic ligands and materials chemistry. "This new surface chemistry provides the path toward both efficient and stable quantum dot solar cells. It should also impact other electronic and optoelectronic devices that utilize colloidal nanocrystals. Advantages of the all-inorganic approach include vastly improved electronic transport and a path to long-term stability." "The world - and the marketplace - need solar innovations that break the existing compromise between performance and cost. Through the partnership between U of T, MI and KAUST, we are poised to translate exciting research into tangible innovations that can be commercialized," said Sargent.